How much does it cost to travel to Jaipur? How much money will you need in Jaipur? ₨1,257 ($18) is the average daily price for traveling in Jaipur. The average price of food for one day is ₨317 ($4.58). The average price of a hotel for a couple is ₨1,553 ($22). Additional pricing is in the table below. These average travel prices have been collected from other travelers to help you plan your own travel budget. How much money do I need for Jaipur? Jaipur, India, famously known as the Pink City, is the capital of Rajasthan and is often a highlight for many travelers to the area. Dating back to the eighteenth century, it is part of the Indian Golden Triangle which also includes Delhi and Agra. It's also a stopping off point for travelers venturing into the desert cities of Jodhpur and Jaisalmer. The city has a population of about 6.66 million people, making it the largest city in the state of Rajasthan and the tenth largest city in the country. Jaipur has a semiarid climate with warm temperatures throughout the year. The summer is between April and early July and has average daily highs of about 86 degrees Fahrenheit. The monsoon season is between the months of June and September and during this time you can expect heavy rains and thunderstorms, but the city is not prone to flooding. Winter is between November and February. During this time the temperatures are mild and pleasant and can range from 59 to 64 degrees Fahrenheit with little humidity. There are occasional cold waves during the winter months where temperatures may drop near freezing. Jaipur is rich in history, culture, and sights. The Amber Fort is one of the main sights in the city. It is a massive palace and fort that is a hike up from town. It's possible to arrange for an elephant ride to the top if you wish, but you should arrive early in the morning. Various other tours to the Amber Fort and other sights in town are also available. Jaiharh Fort is famous as the location of the world's largest cannon. It's about a 1 kilometer walk up from the Amber Fort. Nahargarh Fort is the smallest of the three forts and offers excellent views over Man Sagar Lake. 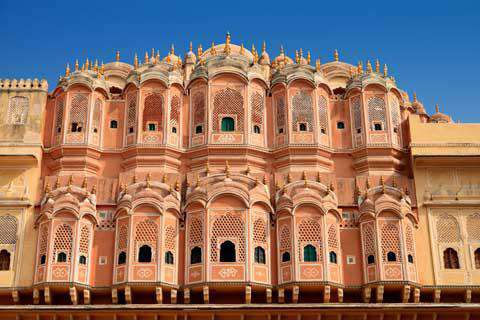 In addition to its three main forts, Jaipur has many temples, monuments, museums, and gardens. It's easy to spend days exploring the sites around this city. The city's three main forts are located just outside of town. Each has it's own atmosphere and is worth a visit for a different reason. Head to the bazaar area if you're interested in doing any shopping. It's literally an explosion of sights, sounds and smells. You'll find everything from cloth, to spices or flowers for sell. It's also a great place to practice your bartering if you see something that strikes your fancy. Budget accommodation in Jaipur is less common than it is in some other Indian cities. The quality for the budget hotels is not high, so in this city it might be worth paying a little more for comfortable accommodation. Jaipur is a large city with many activities that you can enjoy as a tourist. Many people enjoy walking around the city's large bazaar. The bazaar his very vibrant with colors, sounds, and smells. The Amber Fort Sound and Light Show is an impressive show that can be seen from outside the fort, but to hear the narration you must be inside. Raj Mandir is one of the best movie theaters in India and is an experience to visit. If you want to experience a real Bollywood movie then you should definitely take the time to come here. Jaipur is an excellent city to sample authentic Rajasthani specialties. There are some great restaurants around the city that range is size and budget. Here's a great guide to what to eat and where in Jaipur. If you prefer your dishes mild, then it is best to find a place familiar with serving westerners. These restaurants are comfortable preparing food without the traditionally heavy spice that locals are comfortable with. Desert pastries are also available at food stands around town. The sweets are made with honey or sugar and can be quite sweet. They are a great follow up to a traditional Indian meal with all of its rich spices. It's easy to reach the city by either train or bus. Reservations may be required in advance, particularly if you're traveling by train. Luxury tourist trains in India are also an option. Alternatively, some travelers explore the area by private car. This can easily be arranged after arrival in Delhi. Once in Jaipur, taxis, richshaws, and buses are the easiest ways to navigate the city. Traffic can be overwhelming but there are some areas that are conducive to walking, particularly around the main tourist sights. RTDC buses are one of the most convenient ways to visit the city's sights. There are three tours that you can choose from: the full day tour, the half day tour, and the Pink City by night tour. Local buses also travel to most sights. City bus #5 connects Amber Fort, Hawa Mahal, New Gate, and the intersection of MI Road and Railway Road every ten minutes. City bus #2 travels from the train station along Station Road to the City Palace, Minar, and Observatory. Autorickshaws are available for whole day trips to Amber Fort. There are also prepaid autos available at the Jaipur railway station and the Sindhi Camp bus stand but prices are higher than you might pay if you negotiate at a different location.